Big over-ear headphones look and sound great, but there’s no way you’re fitting them under your bike helmet, and you know they’re going to bounce right off your head when your workout (or yard work) gets tough. Whether you’re a commuter or simply an all-around active person, in-ear headphones are a must-have for keeping the soundtrack going no matter what gets in your way. We’re not talking about those muffled, Stormtrooper-colored Apple EarPods (or whatever came with your new smartphone), or even the fancier AirPods. You deserve better. Something with quality performance, stability, and maybe a bit of individual style. 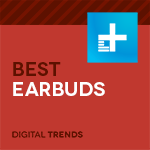 As such, we collected our favorite recent additions to the wide world of in-ear headphones. Some cost a mint (though not nearly as much as the world’s most expensive headphones), while others will barely dent your budget. There’s no doubt that any of these earphones will make you a happy camper next time you hit the road. Why you should buy them: They’re a sweet mix of style, performance, and shocking affordability. We could have gone many ways for this pick, but 1More’s unassuming Triple Drivers just wouldn’t stop popping up into the picture. The 1More aren’t at the top of the class in performance, but what they do have going for them is unrivaled quality and value at their (very reachable) price point. Sure, we could recommend Ultimate Ears Pro’s custom-molded RMs or the UE18+, or even Shure’s mind-blowing electrostatic KSE1500, but at $1,000 to $3,000 apiece, we may as well recommend a summer home at Cape Cod for stress relief — most people just can’t pay those premiums. More to the point, China-based upstart 1More blew our minds when we discovered how little the company wanted for the Triple Driver headphones. For this kind of build quality and performance, we’d expect to pay at least double. So what specifically do the Triple Drivers offer? A gorgeous aesthetic, solid construction, and you guessed it, three drivers for excellent sound. That includes one dynamic driver for the bass and a balanced armature driver for both the midrange and treble. The result is sparkling clarity, smooth and powerful bass, and balanced sound that outdoes everything we’ve heard at the $100 line. Need we say more? How about a Lightning version? Why you should buy them: You’re on the hunt for the best-sounding, most comfortable, and most life-proof true wireless earbuds. Who they’re for: People who want total wireless autonomy on a budget, without sacrificing battery life or audio quality. Jabra’s Elite Active 65t may look like miniature versions of the Bluetooth headsets that helped put the brand on the map more than a decade ago, but don’t be fooled by the aesthetic. With solid battery life, great sound quality, and an IP56 waterproof rating, these little guys best Apple’s industry-leading AirPods as our favorite fully wireless headphones. The Elite Active 65t feature an ergonomic design, with three different sets of eartips to guarantee a good seal. The excellent passive noise isolation means you get the most out of every note, and you can also lower the volume for less ear strain. Overall sound quality is good, coming through clear and balanced, with punchy bass response and a very dynamic treble register. The Elite Active 65t offer five hours of battery life per charge — matching the AirPods and ranking among the best you’ll find at present — and the included charging case adds two refills before you need to find a Micro USB cable. That’s not as much as Apple’s buds, but it’s enough for the majority of use cases. The 65T also match many of the best features we’ve seen from other fully wireless models. Jabra’s Sound+ app lets you adjust settings like equalization, as well as allows you to use either your phone’s built-in smart assistant (Siri on iOS, Google Assistant on Android) or Amazon Alexa to respond to queries. Sensors built into the headphones can be set to play and pause music when you remove the buds, and the Elite 65t can even pipe in different levels of ambient sound, great for hearing cars on the road if you’re a cyclist, or announcements on the train or at the airport while you travel. The IP56 rating means they are safe around high-pressure water jets and protected from limited dust ingress — and that you won’t have to worry about them while you sweat or run in the rain, adding to the overall conveniences of the headphones. All in all, it’s a great package at a great price. Why you should buy them: They have no wires, great sound quality, and offer heart rate tracking. Who they’re for: Those looking for a solid mix of fitness features and good sound for an affordable price. As such, our pick for the best workout headphone is the fully wireless Jabra Elite Sport. Based on Jabra’s Sport Pulse Special Edition, the headphones boast an embedded heart rate sensor in the left earpiece, as well as an IP67 rating that means they can be submerged in 3.3 feet of water for up to 30 minutes. That means they can handle long runs on the hottest summer days, and even a short dip in the lap pool. Plus, they can be easily rinsed off after your grossest workouts. The Elite Sport battery offers 4.5 hours of playback per charge, which is enough juice to last through just about every workout experience except a marathon, and an included charging case adds two extra charges to keep them at the ready in your gym bag. Jabra’s Sport Life app is the brains behind many of the headphones’ workout functions, and features activity tracking and voice prompts to go along with heart rate readings during your workouts. The sound quality is solid, with a punchy bass response and tight treble that brings a good amount of clarity to your favorite inspirational tunes. Sure, the Elite Sport won’t offer the same vivid sound signature as more affordable wired in-ears like the V-Moda Forza, but the convenience of wireless audio should make up for the price difference. Why you should buy them: Comfort, solid sound quality, and the best noise-cancellation tech on the market. Who they’re for: Those looking for the lowest-profile way to block out the outside world. The DSP suite that accompanies the amplified sound engine of the QC20 might render music a little synthetic and over-digitized on occasion, but the resounding hallmarks of Bose’s signature noise-canceling in-ears will likely outweigh any negatives. And while the battery pack is a little cumbersome, it affords you full control over the system in an ergonomic design, while also serving up as much as 16 hours of noise cancellation. Outfitted in dense plastic and dimpled with silver accents, these solidly built earphones absolutely shine when it comes to active noise cancellation (no surprise here), making effective use of Bose’s proprietary ANC technology to drown out the unwanted hum of the outside world and replace it with a peaceful murmur. We’re talking about full-on, walking-on-the-moon-style silence, even if you take them into a crowded bar or for a jaunt through a busy supermarket. The comfortable eartips keep the earbuds in place in almost any situation, yet they also manage to deliver clear sound across genres, with a host of features that complement the first-class noise cancellation. Why you should buy them: Excellent sound and iOS functionality for a very low price. Who they’re for: Those looking to trade out their muddy white factory earpods for something with better sound. It’s fantastic that Apple includes earbuds with every iPhone, but if you really crave audio quality, you’re going to want to invest in some better buds. At a mere $60, Shure’s SE112m+ offer some of the best bang for your buck in our roundup. The dynamic drivers are capable of an admirable 102 dB SPL, with a claimed frequency response of 25Hz to 17kHz, allowing for an open soundstage that brims with taut bass and finely focused mids. They don’t have the kind of fluid detail or laser-like treble response you’ll get from the Triple Drivers, but the sound quality is far above most smartphone buds. The robust build and above-average passive noise isolation of the SE112+ help mask the melange of sounds peppering the outside world, and although the upper register can come off as a tad snappy at times, we adamantly prefer them over the muffled competitors you’ll find at this price. Simply put, if you’re not happy with the sound from your budget buds, but you’re not the type to throw down a full Benjamin on headphones, this is your ticket to ride — or run. Note to owners of iPhone 7 or newer: If you’re looking for Lightning earbuds, we suggest getting the Lightning version of the Triple Driver noted above, or simply going for one the wireless options on this list or those on our thorough Best Wireless Headphones list. Why you should buy them: You’re looking to take control of the sound around you. Who they’re for: People with moderate hearing impairment who still want to enjoy the wide world of sound. While they do play music and take phone calls, the real reason anyone should consider the Nuheara IQbuds is to augment the sounds around them. Whether looking to boost the volume of speech or filter out ambient noise, the IQbuds are the best on the market at helping separate the sounds you want to hear from those you don’t. For people who are hard of hearing, the IQbuds can automatically separate background noise from speech, even offering eight customizable location settings for when you enter different audio environments. Those with more hearing impairment in one ear than the other can also adjust the overall balance of the headphones so that the volume sounds even. A simple and straightforward app and touch controls on the side of the wireless earbuds allow you to quickly pick and choose what you want to hear. Sound quality when listening to the headphones was among the best in their class. And perhaps most importantly, battery life — 3.5 hours for audio streaming and just over 5 hours for audio filtering — nearly doubles their closest competitor, Doppler Labs’ now-defunct Here One. Because the IQbuds do run about twice the price of many traditional fully wireless earbuds, they won’t be for everyone. For those with moderate hearing loss who want to hear music and the world anew, however, these could be a must-have, and stand as a shining example of the future of wireless in-ear headphone technology. Why you should buy them: They sound great, fit well, and aren’t too flashy. Who they’re for: People who want a quality set of banded in-ears that will last them for years to come. If you’re in the market for a reliable set of wireless in-ears but you don’t want to compromise on battery life or sound quality, Shure’s banded SE215 Wireless earbuds are probably the perfect option for you. With a vibrant soundstage and warm, balanced sound signature, the headphones showcase the fantastic sound and great durability that has made Shure a household name in the world of pro audio. A replaceable cable means that you should get years of use out of the headphones, and their smart, ergonomic design means that they’ll stay securely in your ears even during the most intense workouts. With eight hours of battery life, these headphones are more than enough for a full day of listening in the office — and three hours better than the leading true wireless options (with better sound to boot). We run every pair of earbuds through a rigorous process over the course of several days. That includes playing them in all sorts of scenarios — be it on a bus, in the listening room, or at the office — and playing back from a wide array of sources. We know most people use their headphones with a smartphone, often with lower quality MP3 resolution tracks, so we test that, too. However, we also move up to high-resolution audio files, as well as a wide variety of sources, including plugging in directly to a PC or Mac, using USB DACs (digital-to-analog converters), and employing high-quality dedicated portable players and amplifiers. Finally, we compare the earbuds to some of our go-to models, both in their class and price point, as well as a level or two above to find out if they can punch above their weight. Driver: The unit that produces sound in a headphone, made up of magnets, voice coils, and other materials. Typically, the larger the driver, the more power a headphone has, and generally bigger drivers in in-ear headphones indicate a better range of frequencies can be reproduced. Dynamic driver: A single driver capable of covering the entire frequency range. The diaphragm is connected directly to a voice coil in the headphone, with the voice coil moving between magnets to produce sound. Balance armature driver: In a balanced armature driver, the headphone’s diaphragm is connected to the armature, with micro-vibrations producing the sound. Most balanced armature drivers are best within a specific frequency range, which is why many headphones contain multiple balanced drivers, with certain frequencies divided between drivers for full-spectrum sound. Soundstage: The perceived size and depth of the sound coming through the headphones. Passive noise isolation: Noise that is blocked out by the headphone based on its physical shape and size in your ear. Frequency response: The spectrum of frequencies which a headphone is able to reliably reproduce.